You can play it on pretty much anything, which has surely helped. If Minecraft were on the Super NES, it might look something like Terraria, Re-Logic's lovely crafting sandbox RPG that launched around six years ago on PC. 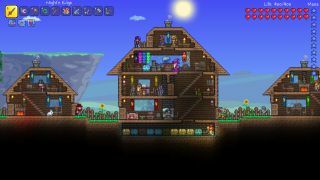 While the popularity of most games dwindles over the years, Terraria's fanbase has only grown in size, so it comes as little surprise to hear that it's sold over 20 million copies since its release. Interestingly, 8.5 million of the 20.5 million copies sold have been in the last 18 months, since version 1.3 was unleashed on PC. That update is coming to consoles and mobile platforms shortly, the announcement post reveals, so if you're not playing it on PC you'll soon be able to tinker with Terraria's latest evolution, which has been gestating on desktops and laptops for a year-and-a-half now. In the years since its release, Terraria's NPC, enemy, boss and biome counts have ballooned massively, while extra modes, events and other bits have been added to the ever-expanding sandbox too. If you're one of its 20+ million players, you might want to take a look at our Terraria mod roundup.